After spending six days shooting footage in Kansas City I realized that two of the biggest influences in fairly recent American history, both had major Kansas City connections and both had the name Walter; Walt Disney & Walter Cronkite. 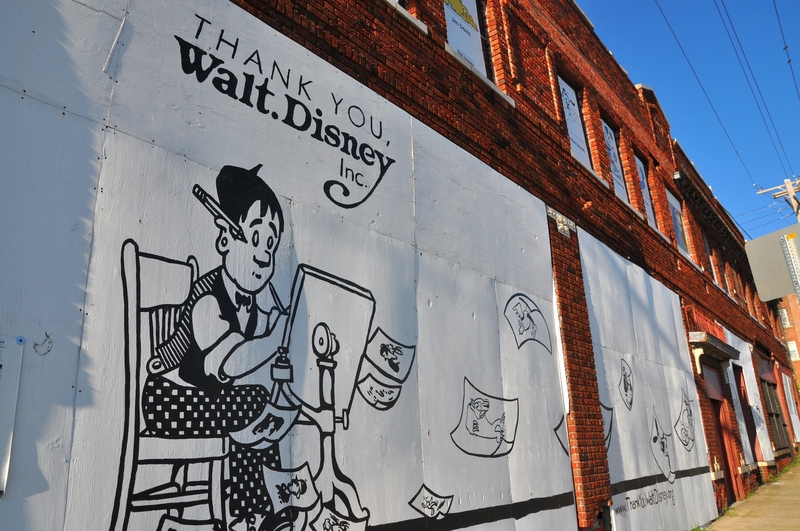 On Saturday I drove by the original Walt Disney studio on 31 Street. Disney was born in 1901 in Chicago and moved to Marceline, Missouri when he was four. Marceline was a rail road town and is where Disney began drawing animals on the family farm. In 1911 his family moved to Kansas City where the young Walt was exposed to vaudeville theater and motion pictures. Part of his education was taking art classes at the Kansas City Art Institute. In his teen years his family returned to Chicago for a spell where he continued taking art classes at the Chicago Art Institute. At age 18 he returned to Kansas City to begin making money at an artist. At first he couldn’t find work, but he banker brother Roy got him a job at where he created advertisements for newspapers. Later he made his first animation commercial working for the Kansas City Film Ad Company. He eventually built his own studio that created Laugh-O-Grams that became popular enough for Disney to have a building and several animators. But even as he grew he was not able to cover the costs of his studio and filed for bankruptcy. If I recall correctly, there was a nervous breakdown somewhere in there when he was around 31 years old. Disney is a good example of a quote I once heard from orange grove baron Ben Hill Griffin when asked the secret of his success; “I honestly don’t know if I’ve succeeded more than I’ve failed, it just that my successes have outshone my failures.” Both Griffin and Disney made much of their fortunes in Central Florida not far from each other—Kissimmee and Frostproof. Disney more than recovered from his Kansas City set-backs and moved to California where he built on his Marceline and Kansas City experiences and eventually became the person with the most Academy Award nominations (59) and the winner of the most Academy Awards (22). On Saturday I visited the Kansas City building where Disney had his first animation company. It’s an area in transition and the building is boarded up, but as a kid who grew up in Orlando going to Disney World it was fun to see the roots of his filmmaking beginnings. Walter Cronkite was born in Saint Joseph, Missouri in 1916 and raised in Kansas City until he was ten. On his way to becoming the anchorman for CBS News (and known as “The most trusted man in America”) he returned to Kansas City at one point to work as a sports announcer for KCMO-AM radio. Dream big, but start small wherever you are.